My name is Jo and I will be playing Ruth in Pirates of Penzance. 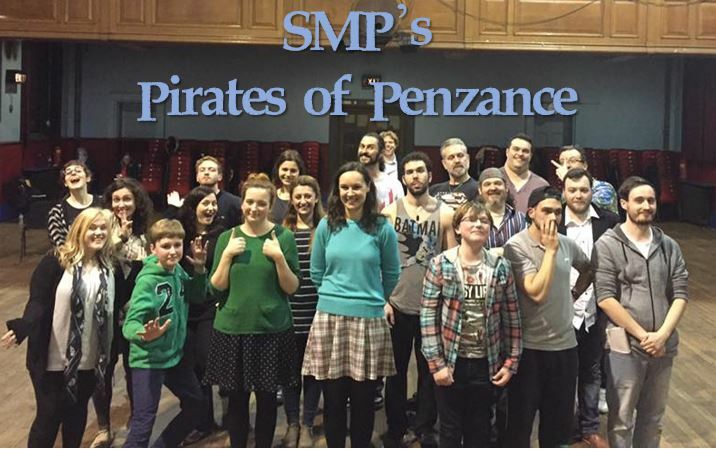 This will be my second performance with SMP, my first show being Beauty and the Beast in 2013, although I have helped out behind the scenes in Our House in 2013 and Urinetown in 2016. I can’t wait to get my teeth into this show as Gilbert & Sullivan operettas are something I love and have been dying to perform in one. I was super surprised and elated to get the role of Ruth. Last Monday saw us staging some of the classic songs from Act 1 (with some of the best directing known to man according to our Director, Warren McWilliams), such as Modern Major General in which Dave Bowman (playing the General) has to really get his face in gear for those super fast lyrics! Staging is always done at the Intimate theatre which has been in existence now since 1937 and reportedly has its own ghost of a hooded monk which walks the aisle between the stalls, according to the theatre manager. I also love all things ghostly and have done since I was a kid- did I mention that? I did my first show at the Intimate when I was 7 years old and have long loved the traditional and authentic feel of the place. We have been going great guns with Erika learning all the songs and the harmonies are coming together beautifully, helped greatly by Alex who plays the keyboard for us at rehearsal. I love this show as its got lots going on and musically is very hard to sing, but the resulting sound is worth all our effort. Its unusual to have so many men in our cast for this show and they have outnumbered the girls at rehearsals which is strange, but lovely. Its also great to have two very talented young men in our cast for this show, Jamie and Archie. Hopefully they will enjoy working hard on a fun show with our lively, friendly cast. I have two little girls aged almost 7 and 3 and a half and they are helping me learn my songs. They follow me around the house singing and I am pleased to get them interested in Gilbert & Sullivan. My husband Richard helps me learn my lines so its a complete family affair. I’m grateful and lucky they support me and always come to my shows. Why not bring your family to see our show too? I’ll be handing over to Chris O’Shea next week when we will be staging our Act 1 finale and learning more wonderful harmonies.